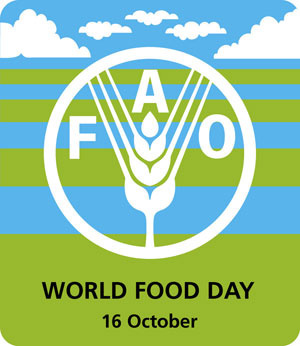 The day has been commemorated since 1945, when it was first instituted by the FAO. The day is purported to have as its goal, the raising of awareness of the stakes of poverty and hunger. It is not a day to ration food or give to the poor. To say the least, the day traditionally goes unnoticed by the millions of people trapped under poverty. This notwithstanding, the UN millennium goal has set the year 2015, as the year when poverty must have been made history. The alarming global poverty makes that ambition very questionable. "Investing in agriculture for food security", the theme of this year's day, is of particular importance. The FAO index indicates that over 2.6 billion people the world-over have their lives dependent on agriculture, which is 43% of humankind. Paradoxically, 2.8 billion people the world-over live on less than $2 a day and 1.3 billion others live below the poverty line of $1 a day. What can explain the irony that so many people continue to live in abject poverty, when more of that number is in fact employed in one way or the other in the agriculture sector? 70% of sub-Saharan Africans are involved in agriculture, yet it is one of the poorest regions of the world, with the FAO estimating that 31% of the entire population is still malnourished. Globally, the FAO index further indicates that 75% of the extremely poor in the world (1.3 billion) continue to rely on small-scale subsistence agriculture for survival. So, what strategies can make this popular sector gainful? Isn't it time that nations begin to re-think their agricultural policies? In many developing countries, lack of a good communication network, such as roads and infrastructure, have seriously reduced the access of producers to markets and information. Perhaps genetically modified food will be the answer for developing countries? Personally, I think that must be an option. Moreover, when we observe World Food Day, it is to wish and hope that countries should subsidise food to the masses, who are sometimes even too poor to buy ready-made food. That should be the message behind this year's theme of World Food Day.